Excerpt: Sixteen Years in Sixteen Seconds Written with elementary school students in mind, this book tells the story of Sammy Lee, a Korean-American kid who discovered competitive diving when he was a kid. But he couldn't practice much: His Fresno, Calif., hometown was segregated, and "colored" people were restricted to one day a week at the public pool — which was then drained, cleaned, refilled and off limits until the following week. 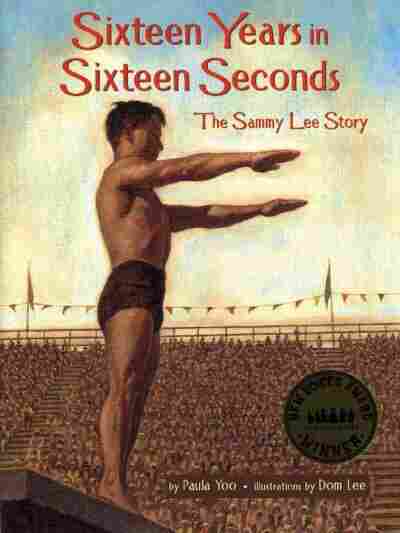 Written with elementary school students in mind, this book tells the story of Sammy Lee, a Korean-American kid who discovered competitive diving when he was a kid. But he couldn't practice much: His Fresno, Calif., hometown was segregated, and "colored" people were restricted to one day a week at the public pool -- which was then drained, cleaned, refilled and off limits until the following week. And Sammy wasn't only fighting prejudice -- he was fighting his father's wishes, who was making huge sacrifices so his son could become scholar, not an athlete. So as Sammy goes to college, they make a deal: If he will pursue his studies as diligently as he does his dream of becoming a champion diver, his father promises to back Sammy all the way. How Sammy manages to become the first Korean-American to win an Olympic gold medal and a distinguished physician is a true story, and a formidable illustration of what can happen when grit and grace combine forces to achieve a difficult goal. Children with be entranced by Lee's illustrations, and the adults who read to them will enjoy hearing Yoo narrate Sammy's story. The sign at the swimming pool read, MEMBERS ONLY. Twelve-year old Sammy Lee knew exactly what that sign meant—only whites were permitted to enter even though it was a public pool. This was the practice in 1932. Sammy would have to wait until Wednesday, when people of color were allowed to go inside. In the meantime, he would get no relief from the blazing California summer sun. Sammy clutched the chain-link gate. He gazed in envy at the children splashing and shouting in the water. He watched as a boy stood on the diving board and held out his arms. The boy flew high in the air and broke the surface of the water with hardly a splash. I want to learn how to do that, Sammy thought. The following Wednesday, Sammy was the first one through the open gate. He raced to the springboard, stood on the edge, and spread his arms like wings. He took a deep breath and leaped as high as he could. Sammy soared. I'm flying, he thought. He tucked his knees against his chest and spun into a somersault. Sammy splashed everyone, including his friend Hart Crum, who was also limited to using the pool on Wednesdays because he was African American. Hart challenged Sammy to do more than one somersault. Sammy, eager to show off, raced back to the springboard. Try as he might, Sammy could only complete on somersault. Hart stopped teasing Sammy and offered to help him instead. He followed Sammy onto the diving board and together they jumped. When they landed, Hart's extra weight helped Sammy leap higher into the air. This time Sammy completed one-and-a-half somersaults before hitting the water! He grinned, eager to practice again with Hart. Over the summer, Sammy discovered he had a natural talent for diving, but his father wanted him to stop wasting time with sports and instead become a doctor. Sammy's parents had left Korea for a better life in America. His father worked hard at their family's restaurant, saving money in the bank and putting his tips in a shoe box for his son's future. "In America," Sammy's father said, "you can achieve anything if you set your heart to it." One morning Sammy and his father drove to the market downtown to pick up vegetables for their restaurant. The streets were lined with flags from different countries. Sammy's father explained that Los Angeles was hosting the Olympics and the flags represented the participating countries. The gold medal winners were considered the greatest athletes in the world. A chill ran through Sammy. Although his father wanted him to be a doctor, Sammy knew he wanted to be an Olypmic champion.